Gift your brother with a set of silver plated Rakhis on this special occasion with free Roli Tilak and Chawal (Design may vary a little ). 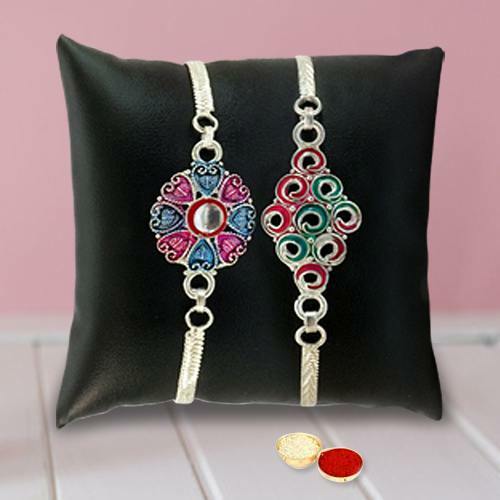 A set of silver plated Rakhis on this special occasion with free Roli Tilak and Chawal (Design may vary a little ). Silver plated 3 Rakhis on this special occasion with free Roli Tilak and Chawal (Design may vary a little ). Silver plated 4 Rakhis on this special occasion with free Roli Tilak and Chawal (Design may vary a little ). Silver plated 5 Rakhis on this special occasion with free Roli Tilak and Chawal (Design may vary a little ). Silver plated 6 Rakhis on this special occasion with free Roli Tilak and Chawal (Design may vary a little ).